1997's GoldenEye 007 was a massive commercial and critical success for Nintendo, selling 8 million copies worldwide and generating an enormous amount of revenue. Unsurprisingly, Nintendo wanted a sequel and even asked developer Rare to make one - but the UK company, which was at the time a second-party Nintendo studio, turned down the opportunity. I thought about this and was not sure I'd really want to. We had a small chat, three or four of us on the team. It was like, 'No'. We sent the message back, 'The answer is no. We don't plan to make another Bond game from another Bond film'. And that was it. While other companies would have pushed through and forced Hollis and his team to produce a sequel regardless, Nintendo accepted the news and no further Bond games were produced by the Japanese veteran. The video game licence passed to EA shortly afterwards, which made the decidedly lackluster Tomorrow Never Dies - a game which benefitted greatly from the hype built up by Rare's offering. It must have grossed, I don't know, $400m or something. You might've thought that on a commercial basis someone at Nintendo, even lower down or higher up or whatever, would've said, "Well, are you sure? ", but out of respect for the creator and the importance of the people who actually made the game, that was it. I wanted to make a game that starred a woman. Partly it was Nikita, the film by Luc Besson, and also Dishonored, a 1930s movie starring a spy who was a woman, and a general sort of sensibility that I thought it would be interesting to have a woman be the centre of attention. We constructed this character, to the very best of our ability, to be the centrepiece of the game. It's very tough in a first-person shooter to develop a personality or a backstory, and what Bond brings you is honestly a lot more. You hear the theme tune and you're right there. The secret of Nintendo is simple: always do good games. Technically Perfect Dark is Goldeneye 2.0. Sure the stories are different, the areas are different, the weapons are different, etc. But the gameplay is very similar and both are very good. There's also some good quotes in an interview from another website about Miyamoto asking them to remove the killing. He wanted them to simply injure the bad guys and then in the credits, have it show you shaking hands with all your victims! While that does sound pretty cute and funny now, I'm not sure it would have fit, and I'm definitely sure it wouldn't have gone over well at the time! @Peach64 There's an article about that part about shaking hands at the end on NLife's homepage. I remember a copy of the UK magazine had exclusive news on GoldenEye 2 and when you opened it up it was Perfect Dark. A lot of readers didn't like that, but PD was certainly a spiritual successor. Activision would've sent goons and treated the Rare employees like felons over something like this. I wonder who will get the Bond license next... I think Telltale (or at least one person from Telltale) hopes Warner Bros will pick it up. The World is Not Enough on the N64 and From Russia With Love are great games, though the Goldeneye reboot was also great. It's a pity the series ended with the horrendous failure of Goldeneye Legends, but Activision only made it a pitiful Call of Duty clone. Probably because Miyamoto wanted to make everyone friends. @Peach64 Another site, you say? The 007 World not Enough had better singleplayer than Goldeneye; I wonder why this game is never remembered? "The secret of Nintendo is simple. Always make good games." That made me feel happy a little. Didn't Rare members say in some interviews that they wanted to have more freedom in making the game, so they can have their own characters, settings, weapons, ect? And a lot of money went to the guy (or company) that composed the Bond theme song. Anyways, I've played Perfect Dark at my cousin's place and they always preferred that game over Goldeneye. No worries. There have been better Bond games since. I'm surprised that Rare didn't make a follow up that was just co op and battle modes with you and your friends or you vs the computer. It sounds like Rare wasn't inspired to do another Bond game with a campaign based on a movie--but nobody played Bond for the campaign mode, it was fun but not the reason why the game was insanely popular. Ain't that the truth! In a perfect world we would have hd remixes of both. I was playing one of those games back in the day, and Macho Man Randy Savage made his entrance and all of a sudden he exploded into a cloud of pixels and this cloud hovered down the ramp into the center of the ring. The pixels rearranged themselves into the Macho Man just as the fireworks on the corners of the ring went off, and me and my friends, just f-ing lost it! Ha he said no to Nintendo but he made it anyways. Perfect Dark is basically GoldenEye 2 without the Bond license. It's pretty much a short last minute opportunity Nintendo want them to do before the license went to EA. It's good they didn't accept it and good that Ninty got rid of it. 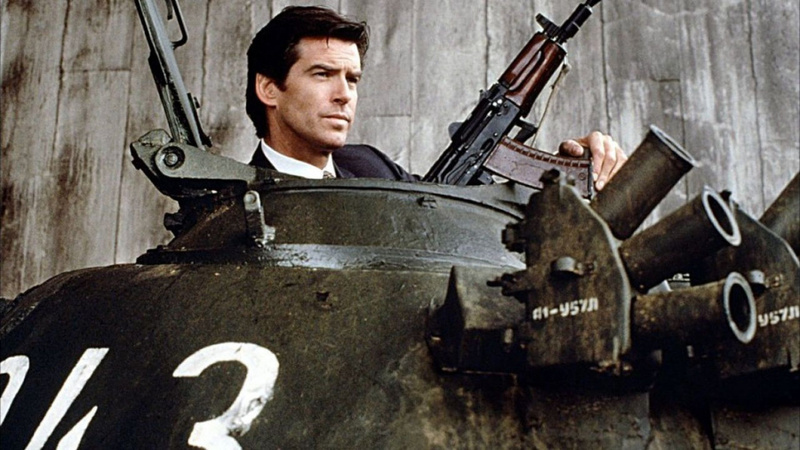 The next Bond film didn't translate as well into a game as Goldeneye so it was a good choice. The only movie game that is actually good. Ever. I think they made the right decision. I wish they stayed with Nintendo. A HD remake on Wii U would sell some dirty amount of copies and make fans so happy! The best Bond game of all time!!! I hated every bond game besides goldeneye and nightfire, agent under fire would have been great with a little more polish I think. A little surprised nintendo didn't offer the license to another dev though. Goldeneye was absolutely a huge part of my childhood and it was so much fun trying to unlock all of the secret cheat codes. I really enjoyed the Wii reimagining of the game too but it can't beat the original! Perfect Dark felt very much like a sequel and is a great game. Still I have many great memories of Goldeneye and really the Nintendo 64 in general. Goldeneye and Mario Kart 64 were and are still (dare i say it) intuitive in offering local four player modes. Many games today offer multiplayer but online only. Goldeneye had it's flaws but I still enjoy playing it from time to time on my Nintendo 64. Now if only someone with some respect for the franchise will obtain the rights to make another Bond game. I'm talking Bond with gadgets, shooting, cars, crazy villians, and a likable cast. Activision basically reskinned Call of Duty and slapped the 007 logo on it; there was no charm, no likable characters, just generic shooting while going from point A to point B. Even in Goldeneye Wii, the characters don't match their personalities or look from the movie. The only plus for Goldeneye Wii for me was the addictive online multiplayer. Rare did an amazing job, and EA eventually made some sweet Bond games. My favorites from EA were the 3rd-person, "Everything or Nothing" and "From Russia with Love." Just the right mix of driving, shooting, stealth, gadgets, and interesting villians. Even had Sean Connery return for his role in From Russia with Love!